BUFFALO – At 6-foot-3 and 195 pounds, new Sabres prospect Jordan Samuels-Thomas possesses a chiseled body ready for the pro game. That imposing frame will help the 24-year-old winger, who compiled 50 goals and 104 points over four NCAA seasons, at the next level. “He’s got high-end potential,” Pecknold said. “I think his main strength is his ability to protect the puck down low, which is what the NHL is becoming. A lot of the hockey is the down low play, which is what makes him so intriguing. Samuels-Thomas obviously impressed the Sabres, who sent a 2015 seventh-round pick to the Winnipeg Jets for his rights Wednesday night. The Sabres must sign him by Aug. 15. The Connecticut native will likely start next season with AHL Rochester, a place Pecknold believes he’ll thrive. 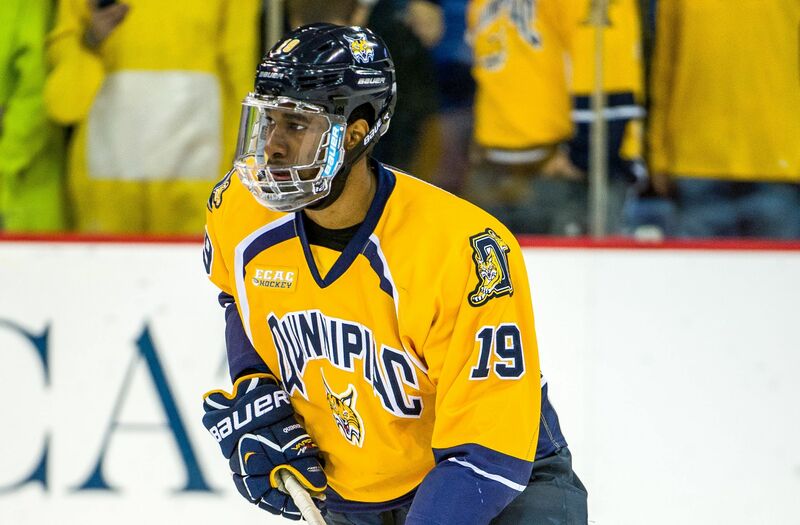 Pecknold watched Samuels-Thomas evolve with Quinnipiac. The youngster arrived raw after transferring from Bowling Green State University. Samuels-Thomas worked during 2011-12, a year he had to sit out as a transfer. Pecknold called that season an “an eye-opener” for the newcomer, a dominant goal scorer growing up. By last season, Samuels-Thomas had developed a complete game. Pecknold used him late in one-goal contests. Still, Samuel-Thomas is a “goal scorer,” Pecknold said.